Welcome to Neelkamal Machinery Company (A Unit Of SRG International Pvt. Ltd)Manufacturer & Exporter of Industrial Packaging & Paper Corrugated MachinesWe are an ISO 9001:2000 certified company, established in 2008 at Faridabad. Our market base isspread across East Asia, Middle East, South East Asia & other countries. Assured quality, Large production capacity, Customization, timeliness, Effective After Sales Service &Industry leading prices are some of the plus points of our organization. Our product list includes Single Face Paper Corrugating & Paper Oblique Corrugation Machines. 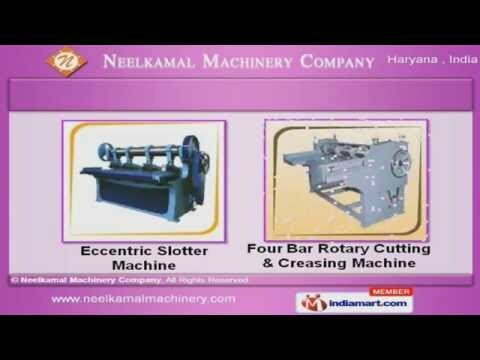 We provide premium grade Eccentric Slotter & Four Bar Rotary Cutting Machine & Creasing Machines. Sheet Pressing & Pasting Machines are some of our best selling products. Our Flexographic Printing & Corrugated Board Cutter Machines are one of the best in the market. We are specialized in offering Box Stitching & Heavy Duty Platen Die Punching Machines. Along with that we offer 3-5 Ply Plant, Porta Cabins & Double Profile Corrugation Machine.